For some, the quest for clear skin is a lifelong journey fraught with many challenges. The health and appearance of skin — which also happens to be the body’s largest and fastest-growing organ — varies greatly from person to person, with variables like age, lifestyle, genetics, and environmental factors all contributing to its overall well-being. 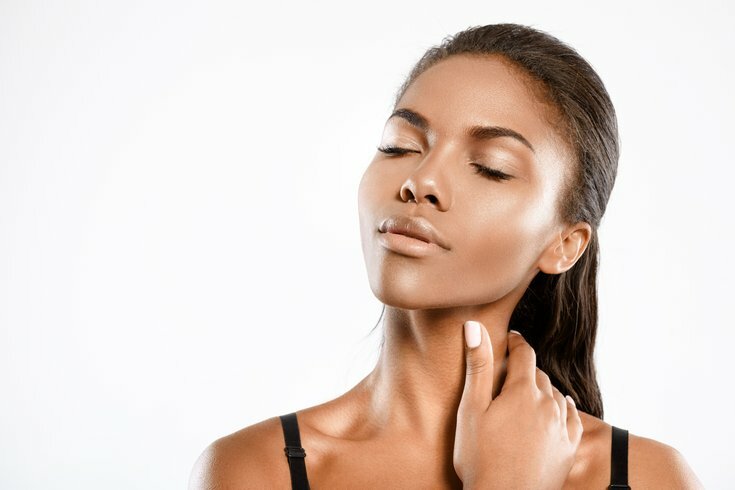 Hormones are another huge influence on your body, and hormonal fluctuations can set off a chain reaction that may end up affecting the appearance of your skin. While some things — like aging or puberty — can’t be avoided, there are conscious steps you can take to achieve a clearer complexion the natural way. Food is what fuels us, and it’s also what keeps us looking and feeling our best. Because food plays such an important role in our lives, it should come as no surprise that maintaining a balanced diet will naturally enhance your skin’s appearance over time. Antioxidants (beta carotene, selenium, and Vitamins A, C, and E) work wonders for your health by improving skin’s texture and protecting it from damage caused by things like free radicals, oxidation, and even the sun’s harmful rays. Unlike lotions or moisturizers that are used as topical treatments, antioxidants protect cells from the inside out, shielding your skin from external threats. These nutrients also promote cell and tissue growth, making antioxidants a powerful weapon in the battle against aging, fine lines, and wrinkles. Fresh foods like blueberries, tomatoes, spinach, beans, salmon, and nuts are all rich in antioxidants and can easily be incorporated into many meals. For suffers of acne, making dietary adjustments can drastically reduce the severity of blemishes that are often caused by foods we eat every day. Cutting out things like dairy and excess fats and replacing them with fresh fruits, vegetables, and whole grains will naturally restore your skin’s radiant glow and protect it for years to come. Water is essential to our internal and external health. A cool glass of H₂O refreshes you on a hot day, and it also refreshes your skin by keeping it soft, supple, and free of impurities. Drinking water is important because our bodies become dehydrated throughout the day as a result of normal functions like sweating, breathing, and urinating. We must replace this “lost” water or risk suffering from skin that feels tight and looks dry. Increasing your water intake will replenish skin cells and increase elasticity. It also clears the skin by flushing out oil and other damaging substances. Water can be used externally to improve skin conditions, as well. Washing your face with cold water will reduce redness and soothe the skin. Steam, on the other hand, is proven to open pores and release toxins that would otherwise be trapped beneath the skin’s surface and cause conditions like acne. As counterintuitive as it may sound, employing the help of natural oils can combat several skin maladies, including clogged pores, dryness, redness, and even the overproduction of facial oil known as sebum . Tea tree oil is a particularly effective all-natural remedy for acne, dry skin, and eczema; however, it is important to understand how to properly use this potent product. Tea tree oil is very strong and should always be diluted with another oil, such as almond oil or coconut oil. Several essential oils on the market today benefit the skin in different ways. Argan oil, for example, is high in Vitamin E, while marula oil is rich in fatty acids and antioxidants. Blends of several types of oils are another effective means of hydrating, nourishing, and protecting your skin. Regardless of your age, where you live, or your lifestyle choices, there are many all-natural ways to achieve clearer skin. Be mindful not only of what you put on your face, but also of what’s going on beneath the surface. Although prescription solutions and chemically formulated products can produce desirable results, natural remedies are a wholesome, budget-friendly way to keep your skin looking as fresh as you feel.